When I became ill many years ago with PND, I was convinced I had a physical illness such as cancer because my body felt so broken. I had no energy in my legs and arms – they felt so fatigued. My whole body felt completely crippled. I spent ages googling symptoms of cancer as I couldn’t understand why I couldn’t walk up the stairs or stand on my legs. I now understand how stress can do this to the body. What I’ve understood is living in that constant flight or fight response mode, is that it does have a physical impact on our body. We are constantly ready to run from danger – hyper-vigilant, anxious and repeating catastrophic thoughts. When we have those thoughts, it puts our bodies into a state to quickly run from the perceived danger (I.e. the flight or fight or freeze state)…. Even though often these dangers aren’t saber-toothed tigers… but the every day small dangers we see around us. These might be is my baby breathing, is the bath water the right temperature, will I poison my baby by giving it formula, a visit from the health visitor or mother in law, walking into a group of mums for the first time, what will happen if my baby goes to bed late, what happens if I don’t get my kids homework into school on time… all these small things where we can feel panic rising. These triggers will be different for us all. If you’ve experience trauma, you will be even more susceptible to this – smells, sights, thoughts, people will quickly trigger you. When we have these thoughts… our bodies are ready to move and pump out all the right hormones so we can evade danger… but we stay stationary. We never make the time to release it like shaking which is what other mammals do (have you ever seen a gazelle after it’s been chased by a lion… it stands and shakes). We in fact think that shaking is something crazy but that shaking is part of the process. And here’s where the fatigue, pain and sensations set in. And why anxiety is often a very physical sensation which is rarely spoken about. When I’m with clients doing EFT… it’s not unheard of to feel sensations moving round the body (chest, stomach, solar plexus, arms, shoulders, hands, throat) or some mild shaking in the legs. There are other much more body-based therapies which support this too and work more deeply – kinesiology, TRE, somatic experiencing, acupuncture, yoga and more and I recognise that they are all effective in this – there is not one right therapy that helps… all do. (If you want to read anything about this look up Peter Levine, Babette Rothschild, Bessels van der Volk or Robert Sapolsky). 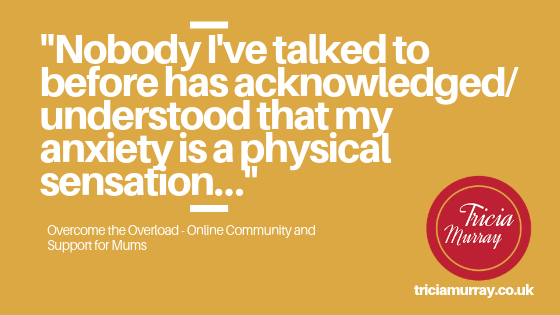 We’re right in the midst of Overcome the Overload pilot. We’ve been using EFT to overcome those sensations of feeling overloaded, burned out, frazzled, stressed, exhausted and fatigued. This is as a way to prevent those physical reactions setting in as well as work through any ‘emotional stress’ that has resided in the body. I’ve had success with EFT clients who have managed to reduce the knots in their stomachs, the butterflies, the migraines, the pains in their bodies. Panic attacks which are a massive physical reaction are really well supported with EFT. EFT is a really simple tool – 5 minutes a day is enough to get you started and to see an impact. In the Overcome the Overload community that what the mums have been doing and seeing huge results – noticeable changes feeling calmer, more relaxed, more accepting. There are now fMRI scans that demonstrate changes in the brain using EFT. It is also now growing in evidence base to the point it was included in the NICE guidelines for trauma as a therapy to do further work in which is fantastic. Overcome the Overload community re-opens on the 12th April. 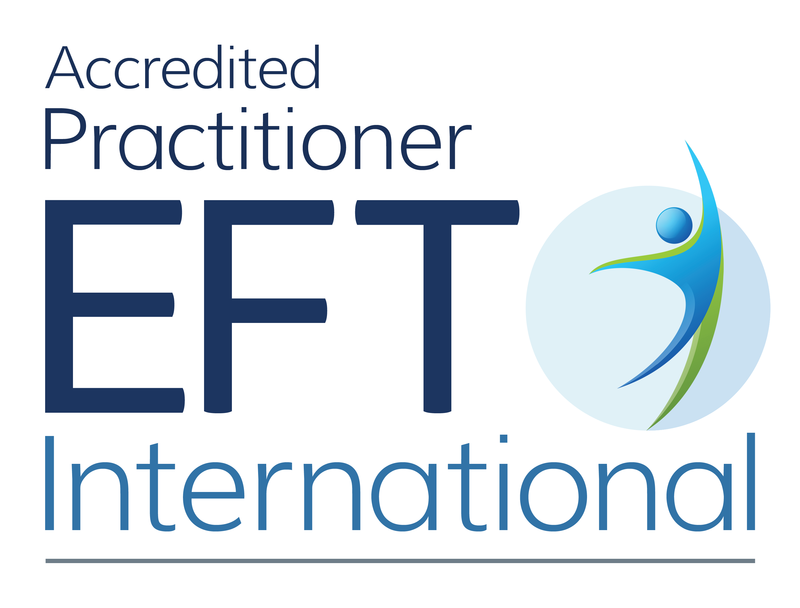 If you’d like to be part of this community and learn to use EFT in a supported way… details are here. Or book in for a one to one EFT session.